In 2011, Eakin Howard’s middle school shop class built birdhouses with folded license plates as a roof. 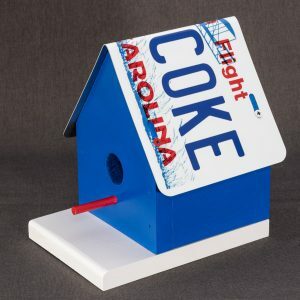 At Christmas, upon seeing Eakin’s creation (a green and yellow painted house with a John Deere plate) his uncle commented that he should sell these birdhouses. The next summer, Eakin did just that, building and selling a variety of college and beach-themed houses in his Aunt’s side yard next to Village Craftsmen. The houses were popular and, by the next summer, Eakin and his father had begun making houses with Ocracoke-themed license plates. These proved to be more popular than all the other houses combined. Eakin and Stefen spent one more summer selling the houses by the side of the road before making them available for purchase in Village Craftsmen. 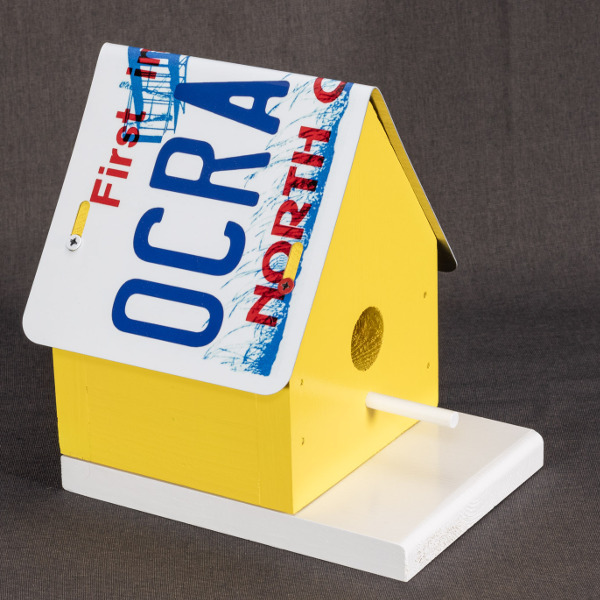 The entrance hole is 1 1/4″ in diameter. This size is suitable for small birds such as house wrens, downy woodpeckers, tufted titmice, and white-breasted nuthatches. 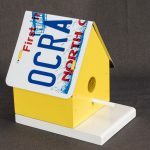 Drain holes in the base help keep the inside dry and the houses can be cleaned easily by simply removing the roof. 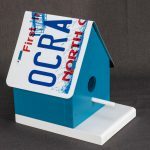 Ocracoke license plate birdhouses are available in a wide variety of colors. We have made a number of custom houses for family, friends, and customers. If you have custom houses you’d like built, let us know. If you own a business and are interested in carrying houses themed for your area, contact us!